Welcome to the Get What You Really Wanted Giveaway Hop, hosted by the Blogging Mamas Network. The Holidays are over and the return lines are long - that's because you might not have got what you really wanted this Holiday season. A fabulous group of bloggers have come together to offer prizes of Gift Cards and Cash to help you get what you really wanted! 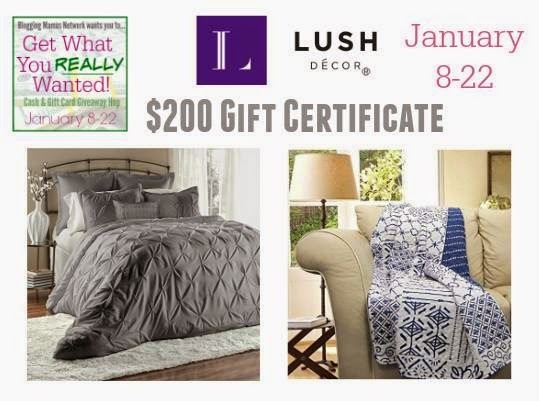 Be sure to hop around to all of the blogs participating and don't miss the amazing Grand Prize of a $200 Gift Certificate to LushDecor.com - enter to win here! Here on Mommy's Favorite Things I'm offering $25 to PayPal!! This is open WorldWide, just know that it will be $25 USD that will be sent! So Easy Being Green, Viva Veltoro, the Blogging Mamas Network, and the Get What You Really Wanted participating bloggers are not responsible for sponsors who do not fulfill prize obligations. id take my daughter to a movie! Buy new socks! Eh, I'm a simple woman! Buy my husband jeans, thank you for this chance to win. It would go toward bills. I would take my husband to lunch. I would buy my daughters a new dress. I would use it towards the purchase of the Fossil Explorer Patchwork Cross-Body Handbag I really want. I am going to buy a few birthday presents for my son! They have great deals on Ebay! I'd use it buy some baking ingredients. I would use the money to put gas in my car. I'd buy some dvds if I win. I would buy a new cloth diaper! If I won i would use the money to buy some books on my wish list. If i were to win, I would use it to buy groceries for the week. With this I would buy some groceries. Thanks. I will use it on new shoes for my daughter. I would get some polka dot black out curtains for my bedroom. Cute! I would put it towards new bed sheets or workout clothes. I would use this toward a new pair of boots. I'd use it to by my baby some moccasins I've been lusting over. There is a cover for an e-reader on Etsy that I'd like to purchase. I'd like to buy some napkins from a WAHM or a new embroidered shirt for my daughter. I'd use it to buy décor stuff for the house. I would pay for my daughters dance recital costume if I win! I would take my husband out for dinner. And add a little to it and see a movie as well. I would probably use it to put gas in the car. I would put it in my vacation fund. I would use it for present for my grandkids. I'll get new shirts for myself. I would use it to buy skylanders or video games. We would most likely use it for bills. Idealy though, I would like to use to go out to eat. I would use it towards my daughter in colleges books! I would get a instapot. I would buy some new winter slippers. I'm lame, I would use it toward bills. You're also missing a t in the http for the entry to visit your FB page. If I won I would use it to buy something for my granddaughter. I have been wanting a small hanging terrarium, I would put the paypal towards one if I win. I would have a mother daughter day. I would get some nice warm slippers. I'd get an apron dress for my daughter on etsy! I'd give the money to my son who is having a difficult time right now. I will buy some of the new books coming out this month. I would use it to help my daughter pay for her college text books. If I won, I'd probably buy some new books. I would put it towards a date night with my husband. I would buy a pair of good running shoes! I would use the money to help buy computer ink. Apply it to an airline ticket to visit my daughter. I will buy a pair of boots. I would put it towards the purchase of a comforter. I would use the money to buy diapers for my baby. I would buy diapers for my newborn daughter. If I win I will use this gift card toward cloth diapering supplies! I'm working on paying off my card, so I'd send it directly to my credit card company! I'd use the money for exercise clothes. If I won, I would buy K-cups. it would help pay a bill. I'll use it for the electric bill. I'd put it towards the camera I've been saving up for! I would use it towards my purchase of a new camera lens! I would probably use it towards ink for the printer! I would transfer it into our checking account and use it for groceries. Thank you!! Put it toward paying a credit card bill. I would put it toward my electric bill. I think I will buy some books! I might buy Vitamins, something for preschool, bunting for my little girl's room, or something for coming baby! If I were lucky enough to win this, I would probably use it to purchase gifts for my beautiful grandkids. I would use it to buy new makeup brushes! I'll keep in paypal until I come across that special deal I want. I would buy new socks. I would put it toward a Tassimo or a Keurig! I would start shopping for my nieces birthday if I won! I would buy some extra groceries. I will buy some of those maternity support tights that go all the way up over your belly. I would save it for the holidays! Never to early to start! I'm trying to save money for my future! I will buy crochet patterns or yarn. save it up towards something bigger. It will go toward Save the Dates for my upcoming wedding! I would pay for a detox soak. I'd buy dd some clothes for her American Girl doll and take her to the movies! BTW the link for visiting your FB page is linked wrong it's missing a "t" in the "http" part of the link! If I win, I would buy some books for myself. I'd probably use it to buy stuff for baby due in May. I would put it in my bank account and buy groceries. what would I get should I win? 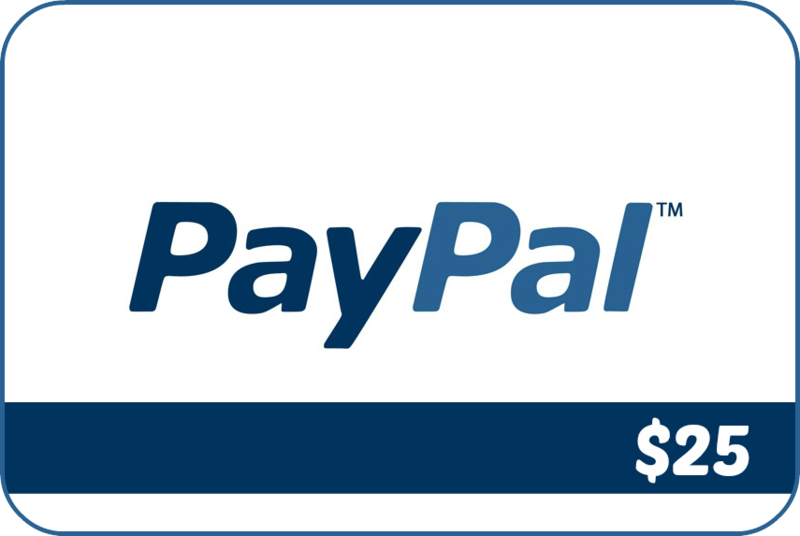 I'd choose paypal, I buy some of my health products online, for you can't find some of the things in stores, which is a pity. I use a nasal emollient that is far superior to mere saline. It should be in stores everywhere. I would buy that, most likely. I would buy some clothes I need. I would buy laundry detergent, Thank you! I would use the money toward my bills! Buy a toy for the grandson. I'd buy a few DVD's. Basic cable stinks. Buy baby stuff for baby due soon. I will put it towards some credit card dept. It would help buy some things for my husbands new business. The money might go for gas. If I won, it would go towards getting my starter kit so I can become a Scentsy consultant. I get a new purse. Probably a date night movie with hubby! I'd love some essential oils! Thank you. I would use it to pay off my paypal credit! This would help with my trip to visit the grandkids. ive been saving for a new camera! this would be a great help! I'd save it towards buying my mom a birthday present. Take my kids to the zoo! I would just leave it in my bank account for emergencies. I would use it towards gas or groceries. I think I would use the $25 towards getting my car cleaned inside and outside. I don't keep my car as clean as I should in the winter. I am having a baby in 5 days or less so it will go towards the medical bills! I would get my daughter a birthday present. My granddaughter will be eight years old in March and I missed her last two birthdays because of the adults.. I would use the money to buy my sons birthday present! If I won I might get some more k cups with it! I'd probably buy a concert ticket. I would probably buy some Kindle books on Amazon. I'd use it to help with bills. I'd put it toward books for my college son. I'd use it on my vitamins and supplements to manage my chronic illnesses. I'd use it towards bills! I will get a new cellphone case and charger if I win. I'd most likely buy K-cups! I'm an American history geek, and I'd love to find an inexpensive copy of the Ken Burns DVD series, "The Roosevelts," on eBay. A disabled woman I provide part-time care to on the weekends was robbed of $200 last week. I would give this $25 to her! I've been trying to raise money for her. Selling my second sewing machine tomorrow and will have almost $100 between that sale and other donations I've collected. Thanks for the giveaway! I would use it to pay bills. I would buy dog food. I would put it in my sons RESP if I won. I would use it to buy myself some Harry Potter jewelry from etsy so I have something to wear when I go to the Harry Potter event at Universal at the end of the month. I would probably buy a Mac lipstick. THere are several books I am dying to read. I would buy books for myself and my son. I'd probably put it towards a trip. I would get my daughter a new pair of sneakers. I would buy me a new pair of non-slip work shoes. I bought mine about a month ago and they're already looking like I tried to race a gazelle and sorely lost. I would use this to take my husband out for a Valentines Day dinner. I will treat my husband to lunch if I win. I would save the money for a vacation me and my husband are taking in May to Maryland. I would use it to buy my husband's textbooks! I will take my husband on a nice dinner date with this! I will save it for our summer family vacation! I'd shop some handmade goodies on Etsy! I would buy some cookie cutters. Thanks for the opportunity!